Do you ever get hamburgers, or barbecue dinner almost ready and then realize you have no buns in the house, or any bread at all, for that matter? No? It’s just me? Well then… just in case that ever does happen to you, now you know what to do. 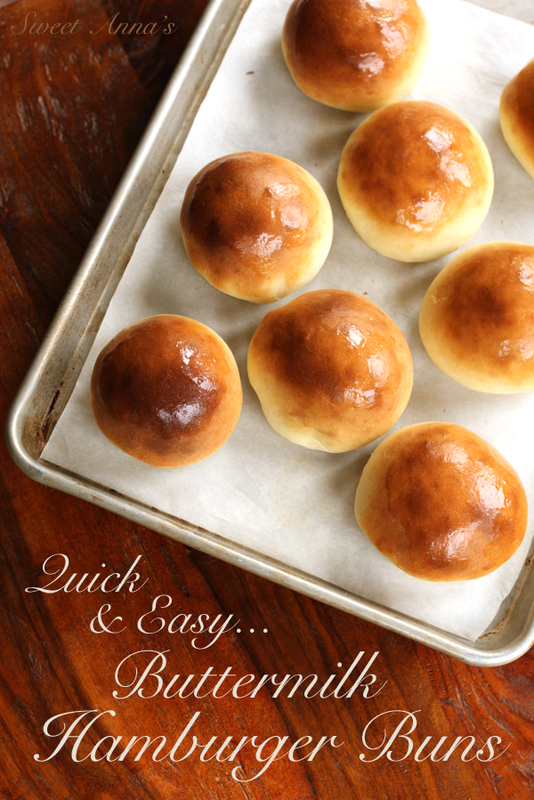 Whip up these super easy, quick and delicious hamburger buns in under an hour and save yourself a trip to the store! *I like to just heat my buttermilk in the microwave, 20 seconds at a time, stirring and checking with a thermometer. Of course you can heat it on the stove too! **Butter can be a little warm, but not hot, no hotter than 115º! ***If you are pulling a cold egg out of the fridge, place it (whole) in a cup of very hot tap water and let sit for one minute to bring it up to room temperature. Preheat the oven to 425ºF and line a baking sheet with parchment paper; Set aside. In the bowl of your stand mixer, mix together the yeast, warm buttermilk, and a bit of the sugar (spoon a teaspoon or so out of your measured 1/4 cup) and let sit for 5 minutes, until it starts to foam. Stir in the melted, cooled butter, the rest of the sugar, the egg and the salt until combined. Mix 2 1/2 cups of the flour, stir, and switch to the dough hook attachment and then add 1/4 cup more at a time, until the dough starts pulling away from the sides of the bowl. Knead (on speed 2 - for a kitchen aid stand mixer!) for 3-5 minutes, adding a tiny bit more flour at a time, if needed, until the dough is smooth and elastic, just a little bit sticky to the touch, but not much. Divide the dough into 8 equal portions, roll them into smooth balls and then place them on the baking sheet (leaving plenty of room for them to grow in the oven!). Cover the baking sheet with a clean towel and place in a warm, draft-free place to rest & rise for about 20 minutes (even as little as 10!). Bake in the preheated oven for 12-15 minutes, until golden brown. Let cool, split, and serve with your favorite burgers, or just some good butter!